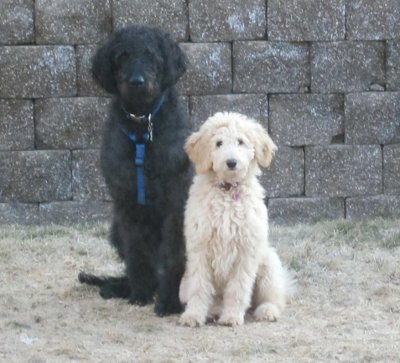 Cooper is a black labradoodle, born March 20, 2011. He is incredibly smart and exceptionally intuitive. He is timid taking some time to pick up on descending stairs, etc. It took him through his second summer to learn to swim. He loves playing with his "sister" although he plays a little rough at times. There are no problems sharing toys or even food. He weighs in at 87lb. Ruby is a double doodle, half labradoodle and half goldendoodle. She was born October 1, 2011 and weighs in at around 53lb. She's outweighed by Cooper but has the spirit to hang in there and give as good as she gets. Ruby looks a lot like Lambchop, but she's blond through and through. Ruby doesn't quite having swimming down yet, she's OK as long as her rear paws touch while she flails away with her front legs. I don't know if she'll ever get swimming. We were guardians for Ruby while she was in a service dog breeding program. She had two large litters of pups before retiring. These were in 2014, tweleve pups, and 2015, ten pups. She's all ours now. Here's a pic of some of the pups. They are great fun to be around, and are upset when separated from us or from each other.